Filled with an egg yolk, these homemade pasta pockets make a deliciously oozy accompaniment to duck. The freshness of the mint, lemon and peas cuts through the richness of the duck. 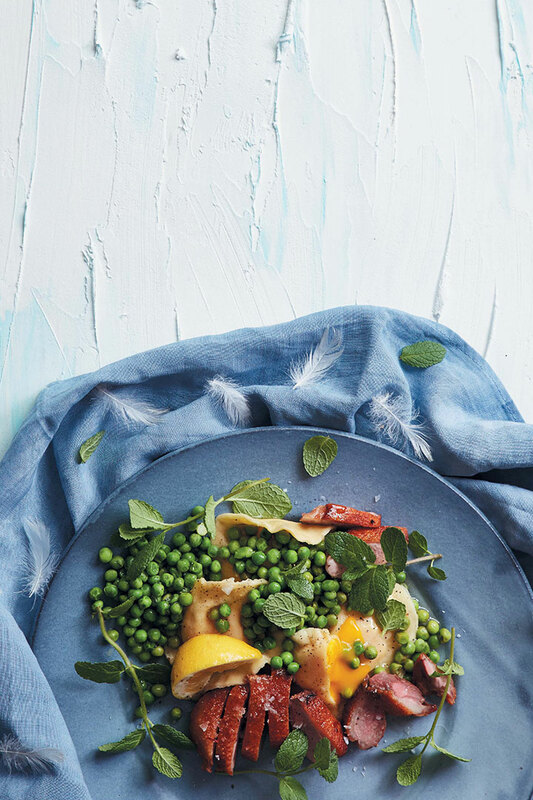 Definitely try this egg yolk ravioli with pan roasted duck, fresh peas, mint and lemon for dinner on a warm summer’s eve. For the pasta, add the flour to a large bowl and make a well in the centre of the flour. Crack the 4 large eggs into the well and add the olive oil. Using your fingertips, mix the eggs with the flour, incorporating a little at a time, until the ingredients are combined. Turn the dough out onto a lightly floured surface and knead until the dough is silky smooth, instead of rough and flaky. Wrap the dough in cling film and pop it into the fridge to rest, at least 30 minutes. For the duck, add the breasts to a cold frying pan, skin-side down and increase the heat to medium. Cook without turning, 6 – 8 minutes, until the skin is golden brown and crisped (regularly pour off the fat that collects in the pan). Turn the duck breasts over and sear the other side, 1 minute. Season to taste. Place the breasts in a roasting tin and set aside until just before serving to cook through in the oven. For the pasta, using a pasta machine, roll your dough through all of the settings until thin sheets of pasta remain, using a little flour to aid rolling. Cut out 16 discs of 8cm-thickness from the pasta sheets and carefully add 1 egg yolk at a time (making sure it remains whole) to the centre of 8 of the discs. Brush a little water around the edge of the pasta discs and cover each with another disc. Enclose, pinching the pasta edges to create thin ravioli edges. Preheat the oven to 180˚C and bring a large pot of salted water to a boil. Pop the duck into the oven, about 5 minutes, until cooked but slightly pink in the middle. Add the egg yolk ravioli to the boiling water and boil, about 2 minutes (do not over-cook as you want the yolks to remain soft). To serve, slice the duck breast and arrange on plates. Add 2 ravioli per plate and add the warmed peas, a grating of lemon zest and fresh mint leaves. Season to taste and drizzle with olive oil. Serve with lemon wedges for squeezing. Make a fluffy egg white omelette with leftover egg whites or freeze in containers labelled with the quantity of whites and use when you next whip up meringues.